In Duane Doty’s recent article, “Commitment to Catching Big Brown Trout”, he outlined ways to target big browns using crankbaits and jerkbaits at Lake Taneycomo. 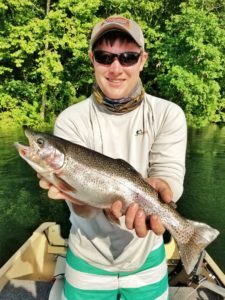 As he stated in the article, the numbers game can be fun but you have to sacrifice that to maximize your chances at a big Brown or rainbow trout. On the 4th of July weekend, Tyler and I decided to commit to catching bigger fish. The water was running when we reached the Cooper Creek boat ramp late in the afternoon. After launching and running up to the dam, we began trolling the Bomber Fat Free Fingerling Shad crankbait. Set up on a stiff five foot rod with eight pound test, I knew the Bomber would give me a good shot at a brown. We drifted down to the “narrows”, an area just above Fall Creek, several times. 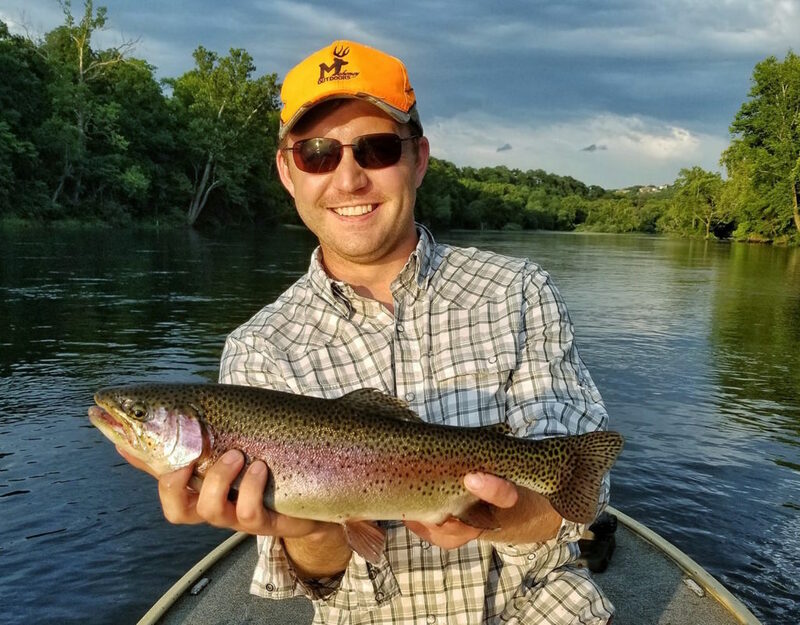 We caught a few good rainbows here and there. The water had been running for a couple hours already, washing away quite a bit of moss, so we snagged very little as we trolled. This was a key point in Doty’s article. Give it about an hour after they start running water so it clears out a lot of the debris. When we began trolling, the first thing I noticed was that every bump on the bottom felt like a fish. I had a few false hook sets before I could tell the difference between a rock and a fish. In order to keep the crankbait in contact with the bottom, I would use a sweeping motion to set the hook. This allowed me to reconnect with the bottom if it was a false hook set. As they ran water the next day, Tyler and I experimented with jerkbaits. We had a few follows but could not get the cunning Browns to commit. 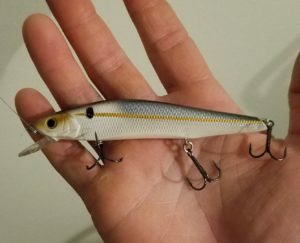 Discouraged, I decided to switch back to the Bomber crankbait. We drifted much closer to the bank than the day before so that Tyler could throw his jerkbait into the heavy cover. I had the bomber on the bottom for no more than thirty seconds when I felt a strike. The fish took drag but even the small ones do when you catch them trolling. As I began to reel I could feel weight but there was little fight. When Tyler asked if I needed the net I said no, figuring I had foul-hooked it. As I drew the trout in close enough to get a look, I quickly realized I was wrong. I definitely needed the net. About the same time we saw the big rainbow, it saw us. At that time, the powerful trout decided it did not want to be caught. With a quick thrust of the tail, it took off. It did this twice before I could get it to the boat. Once along side the boat I thought the fight was over. However, when it caught sight of the net, it made another deep run. Longest forty five seconds of my life! Once in the net we turned on the livewell to revive it. The rainbow weighed 2.7 pounds and was 17 inches long, my biggest ever. We did not manage to land a brown that weekend; however, experimenting with crank and jerk baits did teach us a lot about their behavior. Fishing running water yielded the best results for bigger fish. When the water is running, bait fish are coming through the dam and getting worked up below, causing the brown trout to become more active chasing them down. The fast moving water also forces the trout to make a decision to bite, whereas calm water allows them to study the bait and possibly pass it up when they realize something isn’t quite right. When you decide to commit to bigger trout you may fish for hours with only a few bites. However, when a trophy Brown shoots out from under a log towards your jerkbait or your crankbait stops skipping rocks and you feel the addicting tug, it will be more than enough to keep you throwing jerkbaits or trolling crankbaits all day in the current. 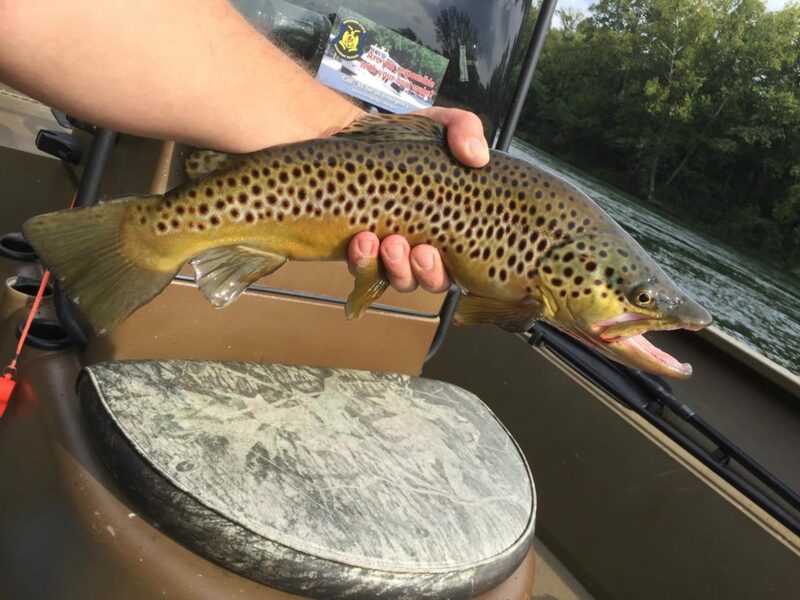 Brown Trout, Lake Taneycomo, Lilley's Landing, Mahoney Outdoors, Payden Hays, Trout Fishing. Bookmark.